This project aims to compare two linear reconstruction operators in the context of an MRI scanner simulation: minimum mean square error minimization, and maximum a posteriori. Their use is motivated by the need to reduce artifacts (undesired components) brought in the original image by the acquisition process. Apart from electronic noise, we have been confronted with aliasing (apparition of ghost images), which is a consequence of k-space undersampling. The choice of the k-space trajectory is critical in order to optimize the scanner's performances. Additionally, the SENSE technique (Sensitivity Encoding) was implemented, which can partially cancel aliasing artifacts by sampling data from several coils in parallel and applying a sensitivity matrix to it. Using the MATLAB language, we implemented a model based on the Fourier transform, and tested our two reconstructors using an undersampled cartesian grid k-space trajectory. Below, on the right, is an example of an image showing aliasing and noise artefacts. 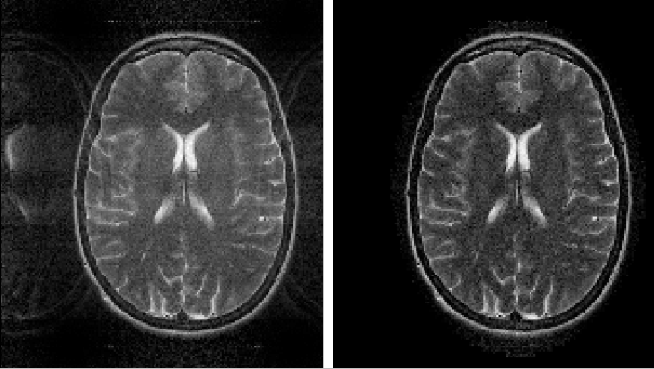 The reconstructed image obtained with MMSE operator is shown on the left.